(CNN) -- At least seven Taliban insurgents wearing suicide vests and wielding machine guns struck at government targets Saturday in the eastern city of Khost, authorities in Afghanistan said. 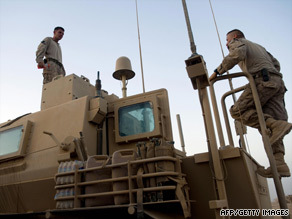 U.S. Marines prepare equipment Friday in Helmand province, Afghanistan. The attackers targeted a commercial bank, a campaign forces building, a national police building and a military hospital, opening fire before detonating their suicide vests, said Defense Ministry spokesman Gen. Mohammed Zahir Azimi. However, NATO's International Security Assistance Force (ISAF) called the attacks unsuccessful, saying the insurgents were killed by Afghan security forces. It said two police officers were wounded. Azimi said at least 14 civilians, three military service members and a police officer were wounded. ISAF said some of the insurgents tried to destroy the front gate of the police headquarters, but soldiers reacted before the militants could enter the compound. It also said six attackers were killed while trying to storm another site. A group of militants in a car filled with explosives tried to bypass a secured checkpoint at an Afghan military hospital, Lt. Col. Stephan Smith, commander of 2nd Battalion, 377th Field Artillery Regiment, said in the ISAF statement. The vehicle exploded, injuring two Afghan national police officers and two civilians, the statement said. ISAF said the Afghan troops remained in control of the scene with ISAF troops assisting. Azimi told CNN that a military operation in reaction to the strikes is over and there is no more resistance. Khost is a city in a province of the same name that borders Pakistan and has endured its share of violence during the Afghan War. This week, seven suicide bombers dressed as women targeted Afghan police officers in Gardez; two would-be suicide bombers died as they tried to attack targets in Jalalabad; and a U.S. service member was killed in fighting. Conflict also has raged this year in southern Afghanistan, where U.S. Marines and British troops have been stepping up the fight against the Taliban in Helmand province to enforce stability ahead of next month's presidential elections. A British soldier was killed Saturday in an explosion during a patrol in Helmand, where British troops are based, the British Defense Ministry said. It is the 20th British death this month. July has been the deadliest month of the war in Afghanistan for international troops, with 67 dead so far this month. Also on Saturday, the U.S. military said three Afghan security force members died and three others were wounded in an incident Friday night between Afghan and international troops in Kandahar in southern Afghanistan. A joint Afghan and international security force had been searching a compound that is believed to be used by a Taliban commander in charge of suicide bombings, the military said in a press release. "During the operation, three Afghan National Security Force members were killed and three ANSF were injured when they fired upon the joint force members as they were patrolling the compound. A vehicle also passed by and fired upon the joint force," the military said in a press release. Interpreters with bullhorns eventually calmed the engagement, the military said, and joint force members met with the Afghan security force leaders. Afghan security forces declined an offer of medical treatment to the wounded and instead provided their own treatment and medical evacuation. A spokesman for U.S. forces in Afghanistan did not elaborate on the incident, which is under investigation. Suspected militants were detained and intelligence materials indicating apparent militant activity were seized.